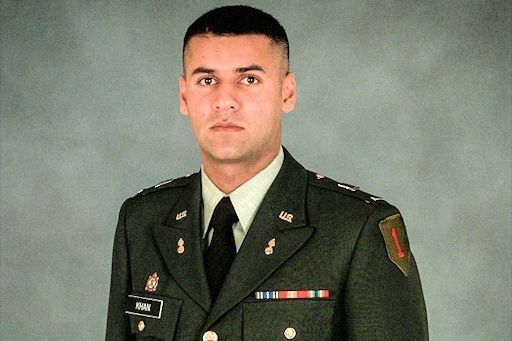 To begin…let it be known that I thank Army Captain Humayun Khan for his service to our country and I honor the ultimate sacrifice he made for her. So with that being said does the old adage ‘like father like son’ apply in this case…no it does not for this father, Khizr M. Khan, in speaking at the Democratic Nation Convention used his son’s war time death in Iraq to help promote a candidate who is directly responsible for the death of four brave Americans in Benghazi, countless others during the monstrosity that was the Arab Spring, and whose ineptitude as Secretary of State helped Barack HUSSEIN Obama give birth to the nightmare that is ISIS. 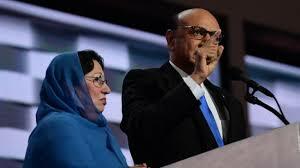 And in Kahn’s willingness to politicize every parent’s worst nightmare, this Gold Star father has not only insulted his son’s memory but has turned his back on the very country he now claims to love…a country he claims to love so much that his wife Ghazala, when it serves his…when it serves their…true purpose…stands silently and stoically by his side encased in a hajib-like head covering when just a few years ago she wore no such garment. Newly radicalized…I doubt it…more like radicalization hidden just below the surface waiting for just the right time to appear. 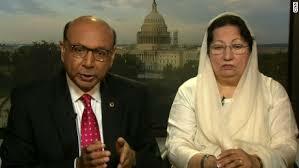 A Gold Star father and mother whose true allegiances seem not to lie with America but with the Muslim Brotherhood for Khizr Muazzam Khan is a co-founder of the ‘Journal of Contemporary Issues in Muslim Law’...as in his being an ongoing promoter and proponent of the subjugating and savage islamic rule of law known as the sharia…hence his wife’s head covering. 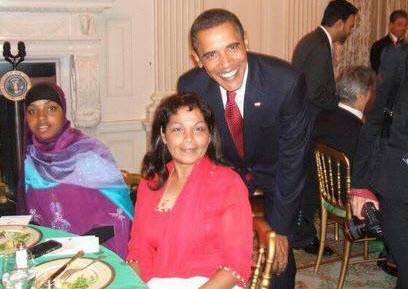 And Kahn’s Muslim Brotherhood ties are really no secret for his loyalties to Said Ramadan, the son-in-law of Hassan al-Banna, the founder of the Muslim Brotherhood, are well known. And Ramadan, a major leader of the Muslim Brotherhood in Egypt, was a man who publicly promoted jihad and islamic revivalism in Malaysia through the Muslim Youth Movement of Malaysia, which was and is actually the Malaysian branch of the Egyptian Muslim Brotherhood. And it’s this very allegiance that has led some to believe that Khizr M. Khan is indeed a Muslim Brotherhood operative…an operative who had the audacity to say at the convention and again afterwards that Republican nominee Donald Trump’s temperament and lack of empathy…and what he calls “his black soul” because he temporarily wants to halt all muslim immigration into our country from what he believes are countries with terrorist ties and to do so until we get “our house in order”…render him unfit to lead this nation. And Khan also stated that Senate Majority Leader Mitch McConnell and House Speaker Paul Ryan have a “moral obligation” to speak out against the Republican standard-bearer. In fact, Kahn warned…threatened actually in both his words and speaking demeanor…with the word ‘blackmail’ coming to mind…that if they do not withdraw their support of Trump post-haste that he will continue to speak out against the Republican nominee at every opportunity given…and then some. But I say what a father has is a ‘moral obligation’ not to use his son…a son who gave his life fighting for this country…as a tool to try and sway an election in favor of those who support and want to welcome into our country those out to kill us all. And when Khizr M. Khan’s wife Ghazala was asked in a recent Washington Post print interview why she stayed silent at the convention…something Trump himself questioned… she answered by responding directly to him saying, "If he (Trump) studied the real Islam and Koran, all the ideas he gets from terrorists would change, because terrorism is a different religion." Taqiyya in print for sure for it’s the qur’an itself that contains at least 109 verses that call for muslims to ‘war against’…to kill…nonbelievers for the sake of implementing islamic rule and sharia law. 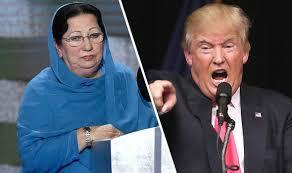 And in said interview Ghazala Khan’s added that "Donald Trump said he has made a lot of sacrifices. He doesn’t know what the word sacrifice means," but I say neither does she or her husband because the true sacrifice made was by her son…a son who voluntarily chose to enlist as an American and to put his life on the line for this country…a sacrifice not made by either one of them. 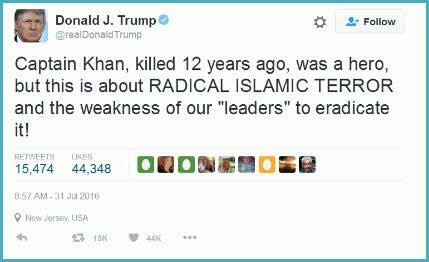 "Captain Khan, killed 12 years ago, was a hero, but this is about RADICAL ISLAMIC TERROR and the weakness of our 'leaders' to eradicate it!" was the tweeted response of Donald Trump, a man who has always stood up for our military…a military he (rightfully) feels is now being used by the puppet Khizr M. Khan who willingly dangles on the end of Hillary Clinton’s Muslim Brotherhood pulled strings… strings put in place by none other than her ever vile BFF and 'so-called' advisor Huma Abedin. 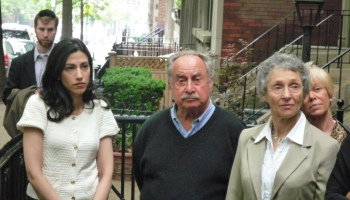 And Huma Abedin...who is all for bringing into the U.S. as many muslim 'so-called' refugees as possible...is the very woman whose loyalty to the Muslim Brotherhood runs blood deep as well as tying her directly to Khizr M. Khan. And how so…the Saudi’s used Huma Abedin’s father Sayed Zaynul Abedin’s paper, ‘Muslim Minority Affairs in the West’ in their devising of a plan to conquer the U.S. through “massive muslim immigration”…immigration jihad if you will…and Khan himself worked briefly with Abedin’s father on this very plan. And what does Khizr M. Khan do here in the U.S. now…he currently heads KM Khan Law Office, a law firm with questionable ties to islamic investors and a law firm that just happens to specialize in both E2 and EB5 immigration services…with both services being a little more than a bit unnerving for rumor has it that the immigration services his firm offers are believed to be ‘visas for a price’…in other words ‘if you pay our asking price you gain entry into the U.S. and if you don’t you don’t get in’…but with Khan’s suspected islamic ties that means at what cost to the U.S. do they get in. At a very high cost I believe for the ‘E2 Treaty Investors’ and ‘EB5 Investments & Related Immigration Services’ are the very programs that are “riddled with flaws and corruption” according to Senator Chuck Grasseley, the chairman of the U.S. Senate Judiciary Committee. And some of those ‘flaws’ in E2 include the fact that E2 monetary investments can be spent before plans are approved; foreign investment funds are not properly vetted (meaning they can come from countries that don’t like us very much); gifts and loans are accepted from foreign governments (can you say bribes); foreign governments can own and operate regional centers and projects; there are no background checks on anyone associated with a regional center; and visas for foreign workers are pushed through even if a person is tagged with a security warning; and these are just to name but a few. And as far as EB5 is concerned, it comes complete with national security issues and abuses, including as per Senator Grasseley, Iranian operatives illicitly trying to enter the U.S. through said program, and EB5 is the very program that Khizr M. Khan is directly attached to. A series of mere coincidences…I think not. But now let’s go back in time for a bit and follow Khan’s history that led him to the above stated points. Khizr M. Khan, a graduate of Pakistan’s Punjab University Law College, moved from Pakistan to the United Arab Emirates…a known hotbed for the Muslim Brotherhood...who then, after a brief layover in the U.S., moved to Saudi Arabia where he worked directly for the Royal House of Saud as an interest lawyer specializing in International Trade Law…trade laws specifically concerning islamic oil companies. And it was while in this capacity that Khan wrote ‘In Defense of OPEC’…a paper defending OPEC against its naysayers in the West, including those naysayers here in the U.S.
After returning to the U.S., Khizr M.Kahn worked for seven years for Hogan Lovells LLP (then Hogan & Hartson), the Washington D.C. law firm that is officially registered to represent the government of Saudi Arabia here in the U.S. through election year 2016 (how convenient is that), and a law firm with ties to the Clinton Foundation…no surprise here. 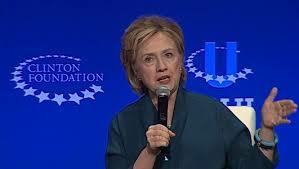 Beginning in 2004, this firm was and is the Clinton’s personal and the Foundation’s tax lawyers as well as their being the lawyers for the very foreign government…as in Saudi Arabia…that has given upward of $25 million to their Foundation. And the circle of corruption and collusion, united together as one lump sum, is now starting to fall in on itself. 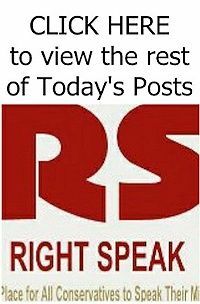 So until both Khizr M. Khan and his wife publicly denounce, for all to hear, the likes of Hamas, Hezbollah, al-Qaeda, ISIS, and the Taliban…until they both herald this country as the rightful and just player in this war against terror…neither of which either of them has done to date…Khan really needs to keep his mouth shut and stop using his son as but one piece in the political election game of immigration jihad. 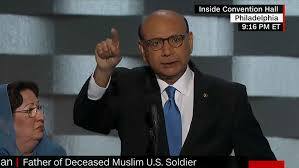 And Khizr M. Khan needs to let his brave son Rest in Peace as the American hero that he was… something he nor his wife will ever be no matter how much the Democrats…no matter how much the media…and most especially no matter how much the Republican primary sore losers…try to make them both out to be. And that includes sore losers like former presidential rival Lindsey Graham who said Trump’s remarks were, "Unacceptable' doesn't even begin to describe it" and former Florida Governor Jeb Bush who called Trump's comments "incredibly disrespectful." What these two and others forget is that Khan’s remarks were the disrespectful ones…disrespectful to the memory of his own son and the freedoms he was fighting and ultimately died for. And lastly, here’s a little lesson in the Constitution for Khizr M. Khan…the anything but self-professed constitutional authority and the man striving for immigration jihad. 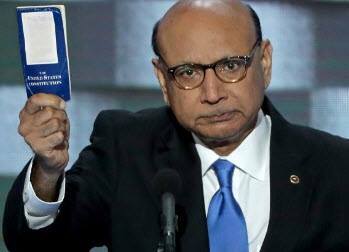 In his referencing Donald Trump’s remarks at the DNC regarding his call to temporarily ban muslim immigration into this country, Khan cited the 14th Amendment as to why Trump’s proposal is unconstitutional. But he cited it wrong as the 14th Amendment applies only to "all persons born or naturalized" in the U.S. It does not now nor has it ever referred to or referenced foreign persons in foreign countries coming here. And as Donald Trump clearly stated…and did so on numerous occasions…this proposed ban "would not apply to U.S. citizens, members of the U.S. military and others with a legal right to be in the United States"…it proves but one thing…Khizr M. Khan truly has ‘selective hearing’ as to what he does or does not want to hear or to what he is told or allowed to hear. And if truth be told that nicely sums up the entirety of the kumbaya blind following ‘you owe me’ members of today’s Democratic party…or should I say the Constitution trampling, America-hating, God-mocking members of today’s Democratic party…as well as those in the Republican party who cater to the left's agenda of political correctness...just saying. Great article. This guy is waving around the Constitution, even though nothing Trump has proposed, is in contravention of it. In fact, Trump is required by a presidential Oath, to defend the Constitution. Importing Sharia promoters is not defending the Const.